Hi dearies! My 100th follower giveaway is ending soon. You can still log in your entries here. Before I start this review I wanna say thank you so much for reading this simple blog. I'm not expecting too much, I just want to share my journey on finding budget friendly and cost-effective skin care most specially organic ones. Honestly, organic products became my skin's best friend. I suffered worst adult acne before, I went to facial salons to somehow minimize the damage it made to my skin but none really worked. It just gave me short-term effects and made my bank broke. It's very tiring to go on the same routine when you didn't notice any significant changes. I'm not saying that organic or natural products can be safe for everyone. I always say this precaution on my review that it can also cause allergies too. So use the product on your own risk. We have different skin conditions, what works for me may not work for you or vice versa. Since I really love the effect of organic soaps on my skin, I'm always giddy to try new brands. I already found my HG soaps: All Organics Calamansi, All Organics Bengkoang, Snoe Vitamin C Rich Calamansi and Snoe Organic Green Papaya that I use alternately or depending on my mood. I just wish that All Organics and Snoe will have a boutique or kiosk near my place or at Sm Fairview so that I don't have to go at Trinoma to replenish my stocks. 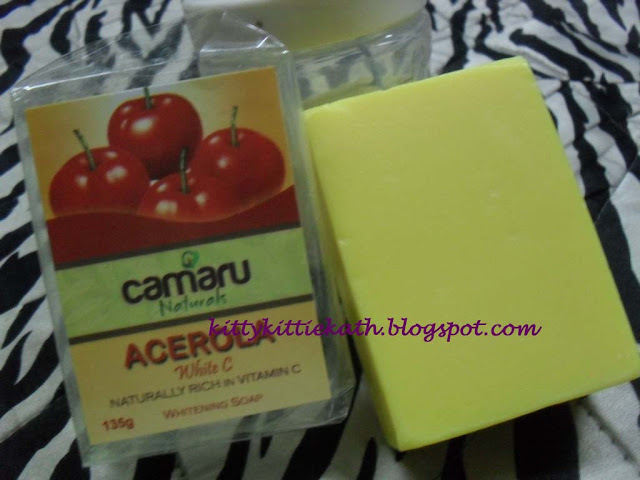 RENEWING your skin with CAMARU NATURALS ACEROLA White C SOAP. Acerola fruit is abundantly found in Brazil. It is one of the world's richest natural sources of Vitamin C. This important antioxidant ingredient helps to reverse the effects of skin damage caused by the sun and pollution and helps brighten uneven skin tone. This whitening soap is made from the extract of Acerola fruit combined with Camellia Oil, Rice Bran Oil and Carica Papaya Extract to give you a healthier, brighter and younger looking skin. 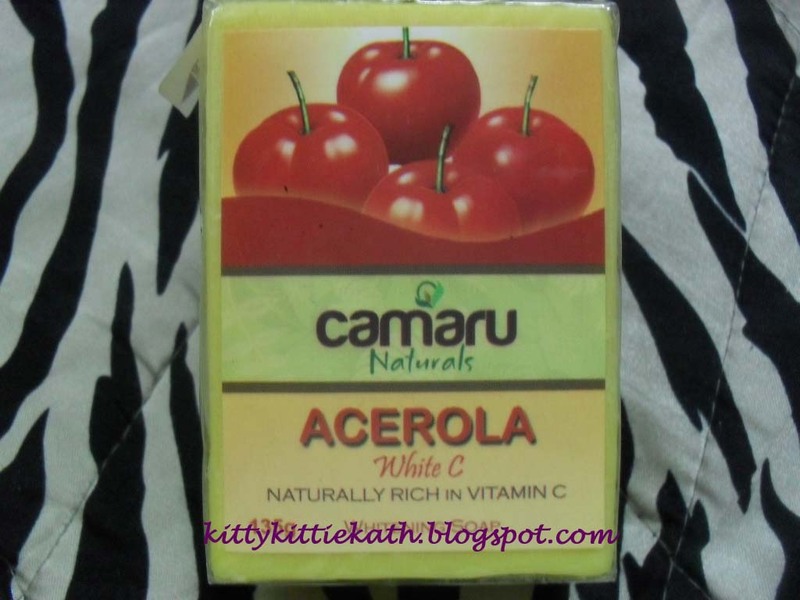 CAMARU NATURALS ACEROLA White C SOAP. instruction for use: Lather directly onto wet skin. Rinse with water. Excellent for use on face, hand and body. Use daily for a smooth, clear and radiant complexion. The price- very affordable for a 135g soap. I love the citrusy smell, it's like lemon lime. It produces a very rich and thick lather. My skin feels squeaky clean after taking a bath. I used it on my body and it really does the job on exfoliation department. It tightens the skin and gives a "glow" that makes the skin supple. A bit drying that is natural with whitening soaps. There's no manufacturing and expiration date. Not easily accessible, you have to purchase online. I give this soap a 4.25/5 rating! I like using the soap on my body. If you find the soap drying, use your favorite lotion after taking a bath. The soap doesn't melt easily so it's okay if you'll let the whole bar sit on the soap dish itself. With my experience with other organic soaps, some tends to melt easily. Always remember that natural skin care products can also cause allergic reactions. It's better to test the soap first on small area of your body just to be sure that it's safe on your skin. I just nominated you for the Liebster blog award, please let me know if you accept it and know that I like your blog a lot! Blog post will be up later. It looks quite nice. I'd like to try it out sometime but right now I'm into Snoe Beauty bars so probably after I try more of those then I'll get one of these. @WW (Angeline)- Hi there! thank you for appreciating my reviews. Will join on your giveaway this week.